I was just becoming of driving age when Williams Grove was shutting down. One of my biggest regrets as an amusement park explorer is having missed out on Williams Grove Park. According to PennDot signage, you would not have any idea that the park even closed. Maybe there is hope? It was tough to see with the lighting that day, but in the distance you can see one of the street lamps that was once used in the 1939 New York Worlds Fair. This is a priceless piece of Americana and it was actually lit up, almost as if this park is frozen in time. We did not get a decent look into the park since it is posted private property, but from what we could see, it appears that some care is put into the property. The Williams Grove Cyclone is actually looking pretty good. Granted I did not get a full look at the coaster, it looks like it is holding up pretty decently after sitting dormant for nearly a decade. Maybe the owner is holding onto it for opening at a later date? Unlikely, but it pains me to see a wooden roller coaster sitting like this, especially one that dates back to 1933. It seems to be facing a similar fate to these other standing but not operating coasters that closed in the mid 2000s, the Joyland Nightmare and the Geauga Lake Big Dipper. It appears as if the park's miniature railway was closed before the park itself closed, judging by the vegetation growing out of it. I could be wrong though. The coaster eerily looks like a train could fly by at any minute. This is the last remaining coaster built by Philadelphia Toboggan Company's Oscar Bitler. The roller coaster lover in me would love to see this coaster come back to life, but reality says that it is pretty unlikely. The adjacent Williams Grove Raceway is still operational. The park really looks as if it were closed yesterday, judging by the bridge entrance way, the old street lamps still on, and the coaster standing in what looks like it could be running shape with a little bit of elbow grease. One of our favorite things to do is to just go on random car rides. One place we have been meaning to check out was Deep Creek, Maryland. The weather was perfect and the autumn leaves were are at peak. We opted to head down through Ohiopyle State Park, PA on the way, and Cheat Canyon and Morgantown, WV on the way back. You can see more photos from our journey here. Now we will focus on the Wisp Ski Resort Mountain Coaster! No tubing happening today! Just think that in not much longer than a month there will be snow covering this! The aerial obstacle course. People appeared to be having lots of fun on it. I am hooked on these mountain coasters now! After riding my first one at Camelback last week, I have wanted to ride more and more! The coaster has a 1300 foot long lift hill. Awesome for taking in the views and your impending doom on the coaster. The lift hill seems endless. I am no longer able to ski due to an injury from a while back, so these coasters are awesome because they get you right back onto the mountain. I can't wait to ride one of these when the slopes are in operation. 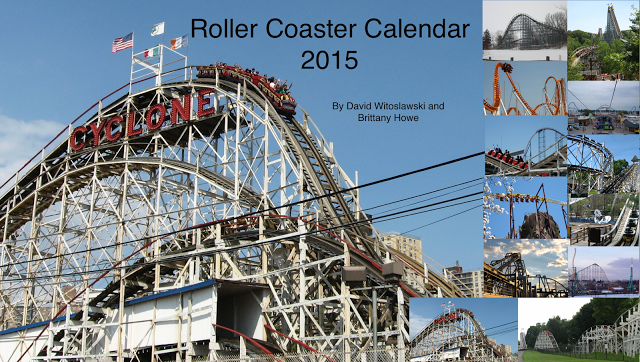 The coasters have a cool design that enables them to be operated year-round. Giant Helix! The switchbacking downward helix elements on these are really awesome. The brisk fall air had me imagining that this is what it feels like to bobsled or ride the luge. You can see how it hugs the slope. Getting there! The best part of the coaster is the immediate descent down the slope. It makes a steep hairpin turn as it starts. The out-of-control feeling on this coaster is amazing! That's one huge lift hill! Whoa what a rush! Here comes Brit! "I braked a little bit, so fast!" Yeah nope, I did not brake until the end. The coaster is buried in the trees in this shot. It is in the area of the right-hand side of the V-shaped slopes in this picture. I highly recommend taking a trip here to check out the mountain coaster. It is also pretty neat to see these ski areas literally in the quiet before the storm. At the top of the coaster you get a beautiful view of Deep Creek Lake, seen here from the other side of the lake. Take an adventure! You will definitely not regret it. The stars aligned well this weekend and I had the lucky opportunity to be driving by Knoebels. It is always a huge treat to be able to visit the park and it is especially wonderful seeing the autumn colors around the park. Here we can see some of the progress towards the new, Zierer designed, Impulse roller coaster. land clearing has finished, with the staple bumper boats and tank tag being removed. This coaster should bring excitement as guests enter the park for it will be located adjacent to the main walkway into the park and along the entrance road. The following photos will give you all of the dirt on this new attraction. It appears that they are close to pouring footers for the new ride. The Power Surge ride remains under refurbishment, and they are in the midst of disassembling the Ferris Wheel for a full renovation and new lighting package that will really transform the entryway to the park. This Zierer built coaster with four inversions should prove to be a huge hit for this family park, now back to the present! Knoebels is in the midst of their Hallo-Fun event! The fall colors mixed with the already beautiful setting of the park and fall decorations make this a really fun event. They do story telling for the young ones at the midway stage. The weather was perfect this past sunday! While there was a decent crowd throughout the park, the Flying Turns was as huge a hit as it was on opening day this year. The work that the Adams and Structural Technologies on Phoenix really broke in throughout the season. As phenomenally as the coaster ran at the start of the season, the coaster seems to be riding as fast as I have ever seen it. The ejector airtime on the return run was especially powerful. I rode in the third row "Schmeck Seat," the seat that many say gives the most powerful ride on any coaster designed by Herbert Schmeck. The autumn colors were especially vivid. In addition to the fall decor and sights of the season, the park also had an array of different food offerings, including lots of apple cider and other products. After picking up some freshly roasted peanuts at the Stony Gables peanut stand, I opted to play a game of Fascination. There is no such thing as playing "just one game" of Fascination though! I ended up winning three times. The scenery was just beautiful! The station of the Twister is really beautiful. I am really thankful that Knoebels takes such pride in their buildings and grounds. The work that local company GCI did upon the Twister wore in as well as the Phoenix's. I opted for a front seat ride and really love the work that was done to the ride. I especially love the little signature GCI "teardrop" added to the bottom of the first drop. Unfortunately it was time to get back on the road, but I highly recommend checking out Knoebels in the fall, especially on a sunday. The crowds were relatively light and the rides were running phenomenally as always. I look forward to seeing how Impulse improves the park in the future. I also hope to see some action with the cliff at some point. It would be great to see a cliff traversing wooden roller coaster down the cliff someday, and/or possibly the addition of an Alpine Coaster like the one at Camelback, or even zip lines. I can see the addition of them being real hits for the park. In the mean time, I love the park that is here now and I am excited to ride Impulse! On Sunday we had the privilege to take in the autumn activities at Camelback, Tannersville, PA in the Pocono Mountains. At this time of year it is an autumn wonderland. 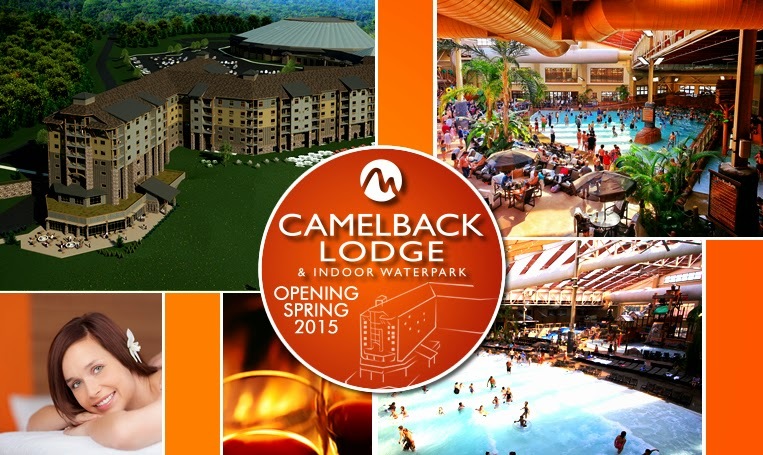 The new Camelback Lodge is really starting to take shape! By the time it is completed, the complex will have 453 rooms and contain the largest indoor waterpark in the Northeast part of the country. Between the neighboring outdoor Camelbeach waterpark, the Great Wolf Lodge, the planned Blue Mountain Ski Area water park, the Kalahari opening at the same time as the new Camelback Lodge next year, and a handful of other area water parks, this region will have a solid claim towards being the water attractions capital of the world. Within close proximity of both New York City and Philadelphia, the Poconos look primed for a resurgence back to the glory days of the old resorts. Here is the progress on the massive new building. Here are the waterside pieces all lined up. Even with how large this addition is, it looks tiny from the top of the mountain! The majesty of this view of the Poconos is unmatched. Now for what we visited for: thrills! Since it is a little too chilly to operate the 37 watersides at the outdoor Camelbeach, we are going to fly on the Alpine Coaster and Ziplines! I was not quite sure of what to expect with the Alpine Coaster. The autumn yellows were especially vivid! It is the option of the riders to go as fast or slow as they like thanks to hand braking! You read that right, the rider controls the speed and stopping! It does not look like it is that intense, but I was definitely wrong. The coaster travels along 4500 feet of track, good for second longest in the state to Dorney Park's Steel Force. With a single car, this length of this coaster feels even longer! Throughout the course it flies through drops and helix elements that switchback down the Camelback slopes that have made the resort a huge destination. Knowing me, you know that I chose to not brake at all until the end. This ride provides a huge thrill, especially on the helix elements. When the car really starts flying, you are really in for a wild ride with nothing but a single seatbelt holding you in. The view from the top of the mountain is phenomenal. Big Pocono State Park is located there and provides one of the most stunning vistas of the Pocono Mountains. This view is looking down the Asp expert trail. Just to think in just over a month you will see nothing but snow in this view. This is where the longest and tallest zipline in North America is launched from. With the huge expansion coming and the plethora of thrills offered throughout the resort, the future looks really bright. 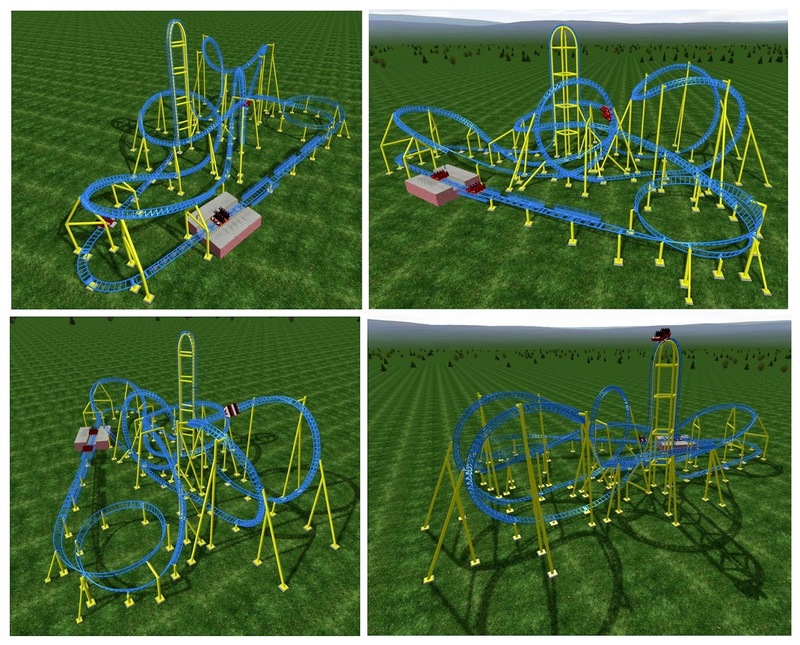 I would love to see them contact nearby Great Coasters International to build a tremendous terrain hugging wood coaster at some point in the near future in addition to adding some more amusement ride attractions. The huge new indoor waterpark resort should be a big hit for the resort.